Emails from your MS Outlook account can be extracted even if you forgot the password or your account simply was lost. 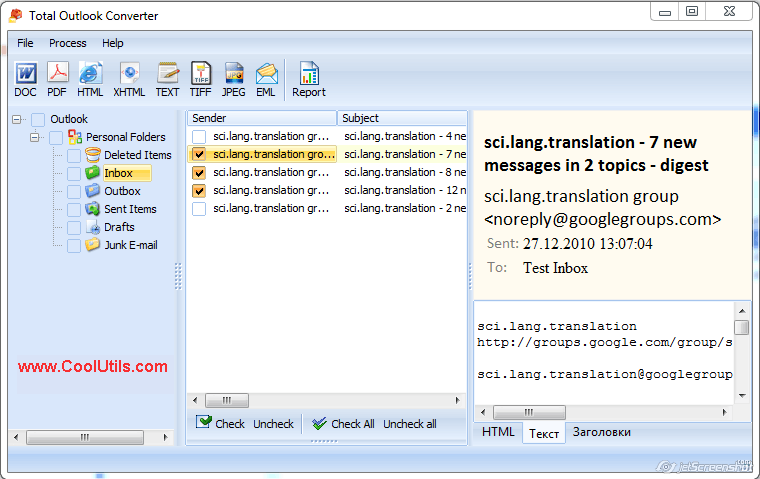 The program stores emails locally in PST files that can be converted to various text formats. If to export PST to DOC or TXT, emails will be easy to read, edit or print. 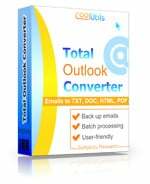 You can convert PST files using Total Outlook Converter. 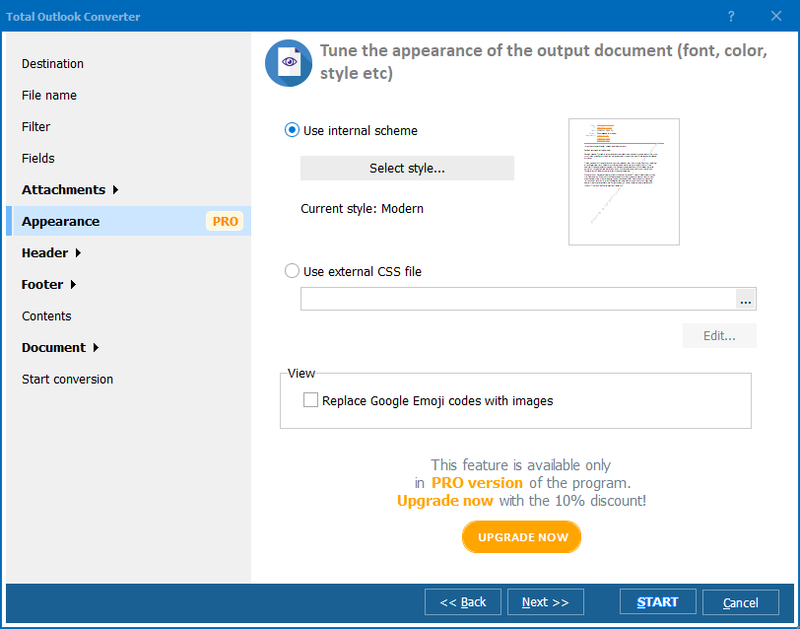 This utility extracts mailbox from the PST file and can easily convert email messages to various formats, such as: DOC, TXT, HTML, TIFF, PDF, EML. Regardless of the format you choose, the program will offer you the same conversion settings. When you export PST file to any of the following formats, there will be ability to set file name template, list of fields for conversion, attachments processing mode, etc. These settings will help you to adjust converter for your needs. Install it on your computer and launch. You will be asked to upload a PST file to the program. When done, you will see the mailbox similar as in MS Outlook. Surfing through the inbox folders, you can checkmark the source messages for export. 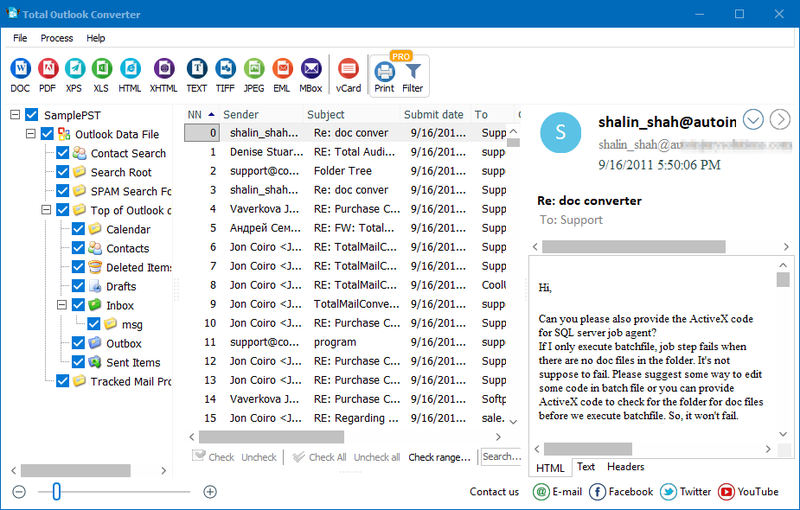 This can be one or more messages - Total Outlook Converter easily processes any number of messages at a heat. To choose sources, simply check them off in the inbox. To convert all messages from the inbox, simply press "Check All". Then you will need to specify the format for exporting messages. If you want to export PST to DOC, just press DOC button in the top-left format bar. In the settings wizard you can specify the settings you need and enable export process by pressing "Start!" button. If you want to convert messages together with attachments, you the Pro progam. It will convert both your emails and their attachments to DOC or other formats. 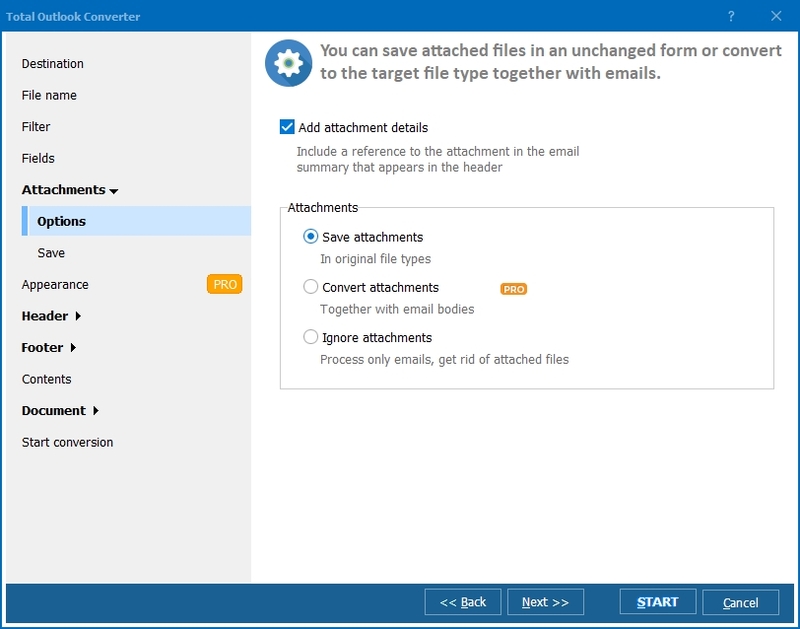 The regular Total Outlook Converter will only convert emails to DOC and save the attachments in a new or the same folder untouched.